Baker Dude Cafe has opened their doors and I was sooo super excited to go check out this new Cafe or several reasons. I know Orran aka Baker Dude and crafted several healthy menu items for the cafe earlier this year. So I was curious to see if his patrons were receptive to my culinary creations. The restaurant biz is really challenging. Food is perishable and it’s hard to know what will sell. One of my dreams has always been to have a restaurant. Well let me rephrase that. I’ve always wanted to create a menu with all my favorite creations and have the luxury of having others create my ideal meals without the shopping, chopping, prepping, cleaning part of the entire process (or having to foot the bill and take the big risk). Don’t get me wrong, I love to prep foods but sometimes I just want someone ELSE to make my fave foods! Let’s face it, eating healthy can either feel like a lot of work or expensive. I hear that from clients All. The. Time. And I totally get it. The good news is that Atlanta is a hot-bed for restaurants with a LOT of healthy options. And knowing this, Orran came to me to create several healthier options for the cafe. One of my favorite foods that I created while snowboarding last holiday season was in response to the avocado toast craze. See, I’m sensitive to gluten - diagnosed with a gluten intolerance but not an actual food allergy like celiac or Crohn’s disease. My body prefers NOT to have gluten. So I’ve avoided breads for a very long LONG time. Even the gluten-free one’s since they usually contain some form of corn and that’s worse than gluten for me. So anyway, I found this scrumptious fancy-looking sourdough bread in Aspen which turned out to be the inspiration for what I created. Do you do that too? Oh btw, sometimes it’s the fructans in the food that cause the issues, not the gluten -I’ll go into more details in my FODMAP’s post so check back. When I say this is one of my favorite things I’ve ever created, it really is. And when Orran, I mean Baker Dude, wanted to incorporate healthy item to the BD menu, I shared this Ah-vocado Toast recipe. Wanna know what was super cool? Two things: I saw the Ah-vocado Toast posted in a clients online nutrition journal before I even had the chance to go visit myself (I literally freaked out because I didn’t suggest that she go… it happened organically!) and then when I went into Baker Dude and ordered the Yogi Yogurt Bowl, I saw the kitchen prepping the Ah-vocado Toast and I squeeled in delight and asked if I could snap a pic. Well, they told me they made it by mistake and did I want it? YASSSSS! And THEN one of the customers who was watching me video and take pics for this post came up to me and said, “I really liked the combo of the pickled onions to cut the fat of the avocado - nice job!” Or something to that effect. So basically I was floating a bit from the whole experience and it was so great to hear positive feedback from actual live patrons without being prompted! Okay so actually that’s THREE exciting affirmations and major gratitude moments! It really warmed my heart because sometimes I think my healthy food tastes, well, HEALTHY. And that’s not a bad thing but I realize it’s not for everyone. Before hitting the slopes, I decided to load up at breakfast with a piece of toasted sourdough bread, teeny bit of coconut oil, spicy Hope hummus, avocado slices, stirfy green (I did a lot of kale and spinach but last night used radish greens) topped with some probiotic-rich food like Wild Brine red kraut, but whatever was local and topped with micro-sprouts. Yeah, those teeny tiny sprouts that make your dish look all fancy-pants. They are packed with protein and nutrition so I love them for just about everything I create. So the Ah-vocado Toast is delish. Orran and Chelf Michal are experimenting with gluten-free and sourdough breads because when you make my avo toast recipe on sourdough bread, it truly is next level to have that tangy taste mixed with creamy avocado and pickled onion. It’s just a great flavor combo. At home I tend to cut a THICK slice of double fermented sourdough bread and stack it with at least ½ cup of cooked greens, cuz I need cups and cups of greens a day to feel good but it might be a bit much for the normal dining guest. But I bet if you asked to load it up with cooked greens they would. And the sprouts are just mini protein-packed nutrient dense goodness. (pictured) is another one of my favorite default meals that I make at home. I make protein muffins and use one cut or crumbled in a bowl with fresh fruit, usually berries, plant-based yogurt (used to be D’tox plant based yogurt but that’s no longer available… boo) and top with all kinds of fun “superfoods” like cacao nibs, hemp seeds, shredded coconut and drizzle with pure maple syrup (low FODMAP), agave (not low FODMAP so not lately) or honey (not vegan OR low FODMAP but still a lot of amazing health properties, especially Manuka honey). Again, this is one of my default meals because of all the textures, flavors, and it’s just amazing fuel that my body and biochemistry love. And that my mindful eating tribe, is what it’s all about. Finding the food that works for your body and feels good during and after the meal :) So try the Yogi Yogurt Bowl at Baker Dude and see how you like it. Orran confided in me that he eats it for breakfast every morning. That ranks up there with my top three nicest food-based compliments I’ve ever received! I also created the PR Pesto Egg Wrap, trust me it’s a savory keto-ish DELISH treat (ugh, I don’t promote trendy diets but if you are doing keto you’ll love it), Overnight Oats + Chia and the Goat Cheese + Honey Toast. The Goat Cheese toast it REALLY good with a thick chunk of sourdough bread and a special kind of Turkish honey so this version might get lost in translation on the tongue. Unfortunately it’s a sourcing issue- no access to that honey and Baker Dude doesn’t make sourdough bread yet. Regardless, we are working on other fun seasonal menu items and I’m excited to roll those out too! Tim ordered the class Quiche Lorraine and he didn’t have any problems wiping it out and took a generous piece of lasagna home for lunch. He only regretted not ordering another to go meal! We also grabbed a variety of the vegan and paleo cupcakes because a) I mean, cupcake and b) we were having a party. Baker Dude had me at Blueberry Lavender but we also grabbed peanut butter cup, German chocolate cake, chocolate, vanilla... a dozen delicious flavors. I love that they don’t use sugar and these don’t taste super sweet. Don’t get me wrong, I’m a big fan of frosting but I don’t like it sticky-sweet. These cupcakes are just the right amount of everything and don’t make you feel weighed down. Sometimes I feel a twinge of food guilt post meal but not with these cupcakes. I forgot to order the Chickpea salad (second shelf to the left in the case, picture above) but o.m.g. did I regret that because it looked amazing and would go nice with one of the sandwiches made on freshly baked bread. PS they also sell loaves of bread but they sell out quickly. I hope they start selling the pita bread that I was lucky enough to sample from Chef Michel. I was never a pita bread fan but that’s only because I’d never had it fresh. And it’s a game changer my friends. Totally. The store-bought stuff is inedible to me after tasting Baker Dude’s. I’m so spoiled! On top of all the delish menu options is perhaps one of the most crucial features that all restaurants who care about their guests should offer: amazing filtered water and ice! 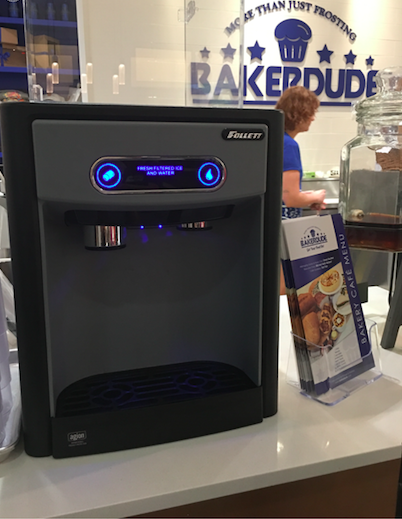 See this self-serve filtered water and ice dispenser? Wow, this just is next level! And it’s FREE! No you don’t have to buy bottled water and destroy and pollute our oceans with plastic bottles. ♽ So the environmentalist in me says THANK YOU ORRAN you are really going the extra mile giving away good water and not contributing to plastic pollution. If you live on this planet, then it’s your duty and mine, to take care of this beautiful amazing environment we should be honored to call home. Do your part. I def do mine! ♽ K great, we’re on the same page! Oh and they also have live entertainment at night! So there really is a little bit of everything that this bakery and cafe has to offer. Grant Park residents are super lucky to have the entire staff at Baker Dude in your ‘hood. Make sure to go check it out and let me know what you ordered. BTW a gourmet cookie place is opening next door so you know I’ll have to weigh in on the chocolate chip ones. PS: you can have dogs INSIDE the Beacon but not Baker Dude so we sat outside of the cafe at a table with Kingston and Orran brought him a container of filtered water… It doesn’t get any better than that!